An Israeli policewoman is suspected of shooting an unarmed Palestinian “for fun” while on duty near a checkpoint in the occupied West Bank. The 20-year-old policewoman was arrested yesterday and appeared before Jerusalem Magistrate’s Court in a bail hearing. The court heard that the policewoman allegedly shot an unarmed Palestinian in the back with a sponge-tipped bullet “without any operational reason”, leaving him seriously wounded. The court’s judge, Elad Persky, said the policewoman seemed to have shot the Palestinian “as a dubious form of entertainment”, before ordering that she be held for another three days. The attack is believed to have occurred in May, while the policewoman was on duty near the Al-Za’im checkpoint, situated near the illegal Israeli settlement of Ma’ale Adumim in the occupied West Bank. However, Israel’s Justice Ministry only learned of the incident recently “while investigating another case in which members of the Border Police allegedly beat a Palestinian for no reason”, Haaretz reported. The 20-year-old is now being “questioned on suspicion of assault and battery, [as well as] obstructing justice, since she allegedly told her friend—an IDF soldier who knew about the investigation and was summoned by the Police Investigation Unit to testify—she did not know anything about the incident,” according to Ynet. Four other members of Israel’s Border Police – who are believed to have witnessed and filmed the shooting – were arrested alongside the woman in question. The four were released “with restrictions”, Haaretz added. The policewoman’s attorney, Itzik Cohen, denied the charges against his client, saying: “The policewoman categorically denies that she fired a sponge-tipped bullet at the Palestinian man. Needless to say that the defendant’s face does not appear in the video obtained by the Police Investigation Unit, and nor does her voice”. 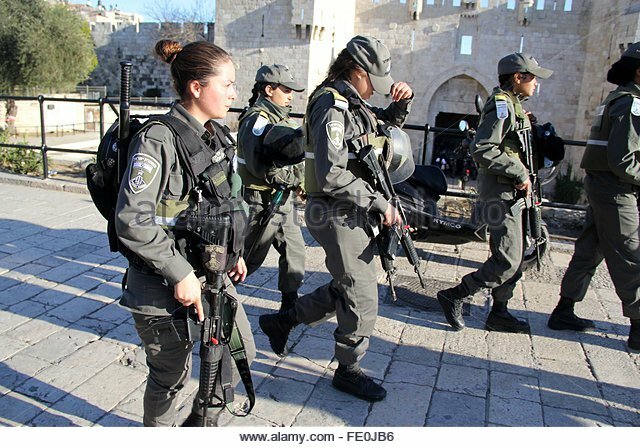 The policewoman’s actions resemble those of Elor Azaria, the Israeli occupation force soldier who shot and killed a motionless Palestinian in Hebron in 2016. Azaria was convicted of manslaughter in January 2017 and handed an 18-month prison sentence. In September, Israel’s military chief of staff cut Azaria’s jail term by four months and by March 2018 it had emerged that Azaria would be released early for “good behaviour”. This entry was posted in News and politics and tagged 20 Yr Israeli policewoman, Shoots Him For Fun, West Bank Checkpoing. Bookmark the permalink.